The Acaya Golf Resort & Spa is nestled in the heart of the stunning Italian countryside, yet still boasts a perfect location as it is just a 20 minute drive to Lecce’s historical centre, and 5 minutes to the beautiful coastline of southern Italy. Surrounded by an abundance of olive groves and captivating Mediterranean landscape, this fabulous property also conveniently neighbours the Acaya Golf Club, making it a golfer’s delight. This hotel undoubtedly boasts a perfect location; with easy access to a beautiful beach, a historic town and golf course, you will find everything you need at your fingertips. Lecce is a stunning town with many hidden cultural gems, including the Castle of Charles V, a famous historic monument. Other attractions here include the Museo Faggiano, an archaeological site, or the Basilica di Santa Croce. Not only does Lecce offer several exciting excursions, but it also boasts an array of authentic restaurants and bars, the perfect setting to indulge in true Italian cuisine. Boasting stunning architecture throughout the town, it comes as no surprise that Thomas Ashe, a 18th century traveller, described it as ‘the most beautiful city in Italy’. Golfers are sure to love this property with such a fantastic golf course just next door. On this course, players can truly admire the breath-taking scenery surrounding the resort with magnificent views of the countryside offered throughout. With a wide variety of challenging holes and beautiful landscape, the Acaya Golf Club is a course not to be missed. Each of the elegant guest rooms at the Acaya Golf Resort undoubtedly take advantage of its stunning setting, offering views of the golf course, garden or Puglia countryside. All rooms include modern essentials, such as satellite televisions, complimentary Wi-Fi and a well-stocked mini bar. Guests are also provided with tea and coffee making facilities, as well as bathrobes and slippers. The hotel features an array of fabulous leisure facilities, including the Acaya Golf Club 18-hole golf course on-site, and 2 outdoor swimming pools which provide the perfect setting to soak up the Italian sun. The spa facilities include a whirlpool, sauna, steam room, Jacuzzi and Turkish bath to help you relax after a round or two. The Acaya Golf Resort boasts an array of dining and drinking options to its guests, and offers an opportunity to enjoy a true taste of Italy. The Gian Giacomo restaurant offers a wide range of fine cuisine using the regions freshest local produce from a Michelin star chef. Furthermore, a daily breakfast buffet is also on offer to guests. 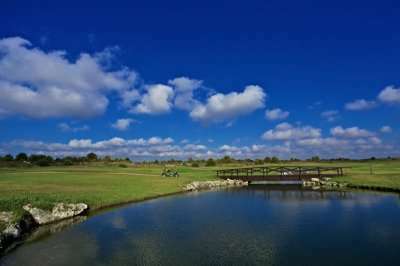 The Acaya Golf Resort & Spa is a superb resort, offering everything you need for an unforgettable golf holiday in Lecce.